Juliana learned to ride. For such a brave sim, she looked surprisingly worried. I tried to have her ride to school one day, but as soon as she’d dismounted she ran all the way back to the house to try to catch the school bus. It took her a few hours to get home, by which point the bus had already left, but I couldn’t cancel the action out. Huh. Imani and Hailey both changed into their maternity wear at the same time. 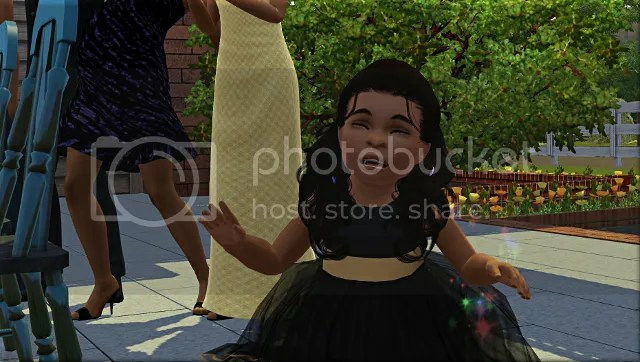 I decided to let Imani and Booker’s child be next generation’s final heir, since the Holcomb-Shepherd branch of the family already has a representative in Jaylen and Hailey’s daughter Janessa. Aasifa grew up into an adult. 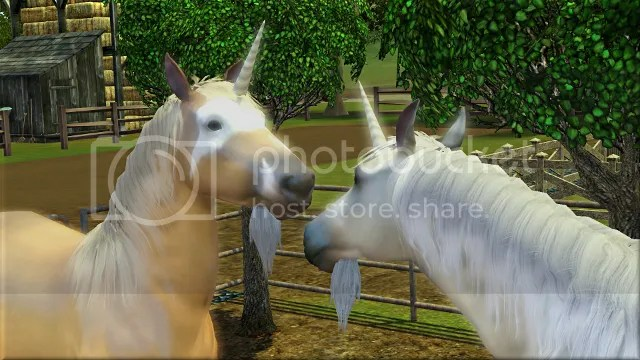 I thought only male unicorns had beards, but apparently I was wrong. Sassie gave birth to two kittens. I just accepted the game’s name suggestions, Boo and Tia. Their coats are a bit patchy but not too crazy, but for some reason Boo looks like a completely different breed from either of his parents. He’s really skinny with very short hair and big ears; I don’t really understand that. Tia stayed close to her mum, while Boo went off to explore the house and playfully swat at Imani’s legs. Okay, random breed assignation aside, that is one seriously cute little face. 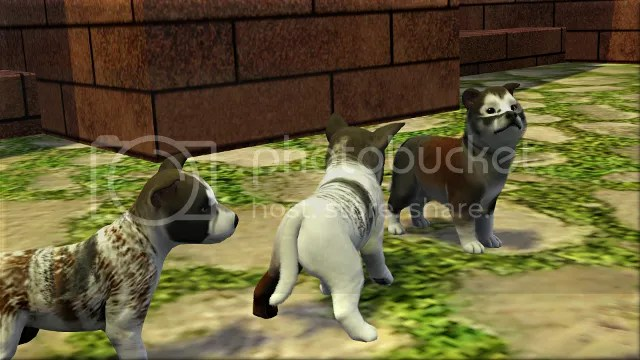 Things certainly could have been worse, as I realized when, spying on some inactive sims, I came across Pantoufle and Ginger’s litter, now all adults. I have no idea what’s going on here. That’s Ginger second from the right, and Pantoufle’s a poodle, so I don’t know why two of their puppies have such different head shapes and fur lengths from them. Those combinations of pink, white, and tan (in various degrees of splotchiness) are obviously inherited, but is everything but the coat colour just totally random? I can’t think of any other explanation. Anyway, back at the legacy house, Janessa had a birthday party. I gave her the lucky, daredevil, and perfectionist traits. I got Juliana and Janessa’s favourite dishes mixed up and had Cassandra serve veggie lobster instead of veggie dim sum, but it was perfect quality anyway so no one minded. Tamsie certainly looked very interested in the meal. I should probably have had someone scold her for being a piggie but at this point I’m just too in love with everything she does to tell her off. As compensation for messing up Janessa’s birthday meal, I bought her an ant farm for her bedroom. I didn’t even know this object existed until I was looking through the Pets folder for something else, but I think it’s pretty cool. Imani and Hailey gave birth to Willard Singleton-Marks and Lorinda Holcomb-Shepherd. I made Willard a slob and virtuoso, and Lorinda rolled disciplined and heavy sleeper. 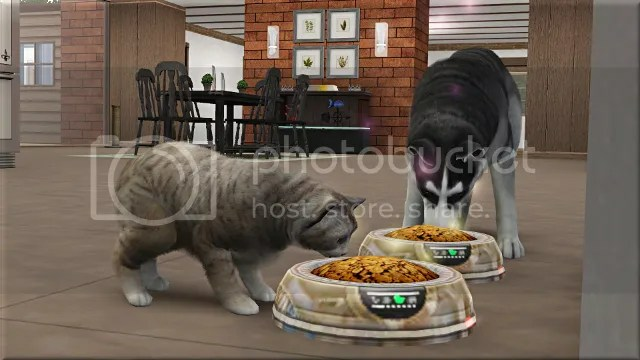 Shadow and Tamsie had quite a few lifetime happiness points to spend, so I got them a ‘pet hygienator’ which prevents and cures fleas, and two bottomless pet bowls, which don’t need to be refilled and give a +10 moodlet for every meal. Juliana and Janessa went to visit the paleontological dig on the outskirts of town. 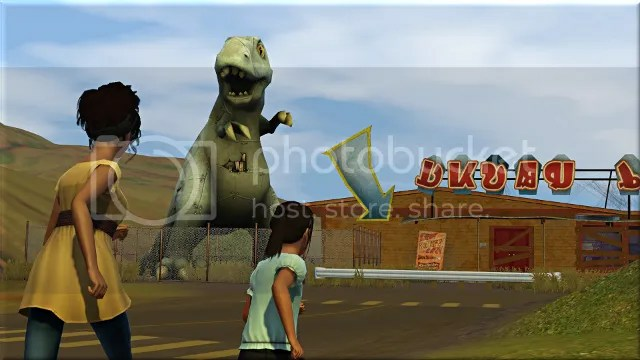 I think this place is just so awesome; for me its actually the most interesting thing about the town, but then again I always get a bit more excited about dinosaurs than I should, being neither a professional paleontologist nor a twelve year old child. I just wish there were a bit more to do: since it’s not an actual lot, the girls couldn’t even play ball or sit and do their homework there. Still, it’s great to look at! Janessa’s ants had been working on their own dino dig, having excavated what looked like a fossil inside their colony! 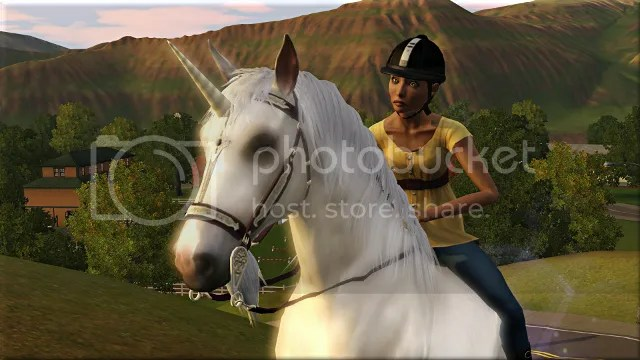 I was running out of new things to do in Appaloosa Plains and starting to feel ready to make the move to Starlight Shores. 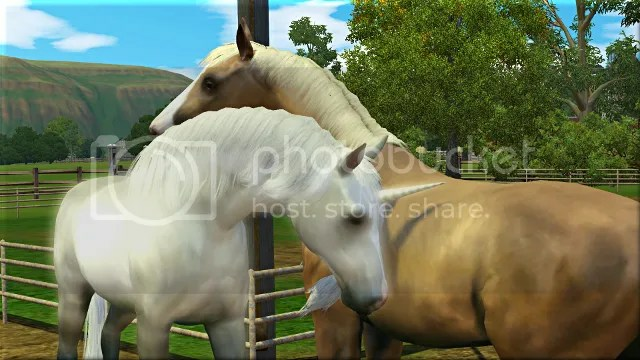 Unfortunately I didn’t see the houses there being able to accommodate Gaucho comfortably, and I also worried that he’d be lonely without any other horses around, since I prefer to play with pet immigration and wild animals both turned off (thanks to Nraas Story Progression and Register). With these concerns in mind, I made the difficult choice to send Gaucho to live with Shawnee on his farm. Jaylen petted his friend one last time. 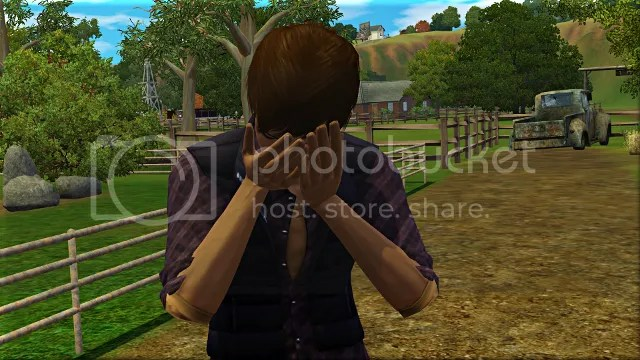 I felt really guilty doing this, particularly when Jaylen, with no negative moodlets or way of ‘knowing’ what I was up to, burst into tears. But I think Gaucho will be much happier staying in the spacious plains of the Midwest with Willow and Aasifa. The final thing I wanted to do was let Tamsie have puppies. 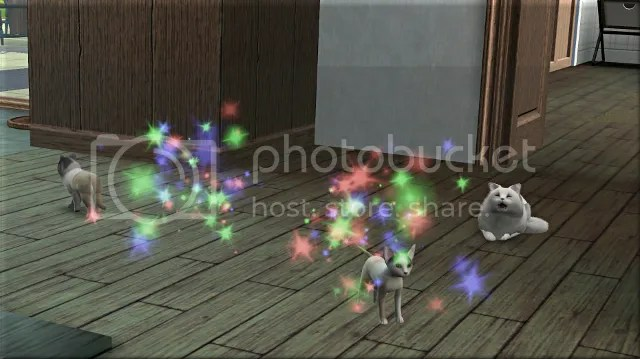 I stayed in Appaloosa Plains just long enough for her to give birth to her litter, an unconventional-looking bunch, covered in what I can only describe as a toddler’s crayon markings and splashes of paint. But really, at the end of each day, the absolute adorableness of the ‘snuggle with…’ interaction (leg/body clipping issues aside!) outweighs their rather unusual appearance. Welcome to the family, little ones! Well, that was Pets! What a nice expansion pack. 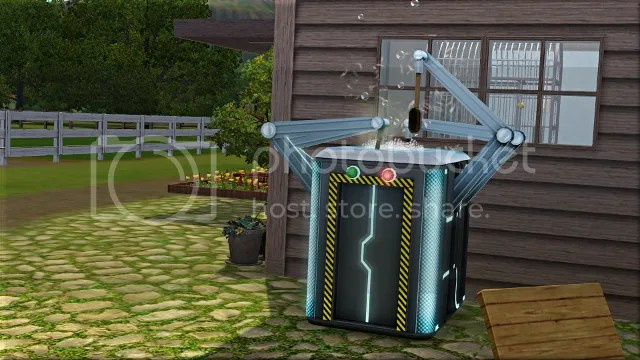 I’m no animal expert but to me the animations look astonishingly good, all among the best The Sims 3 has ever given us. 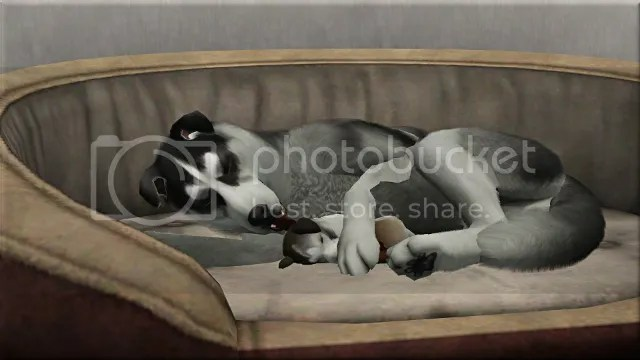 I love all three of the major pet types, though for me dogs probably have a slight edge over the others because there’s so much to do with them. I didn’t get a chance to invite any small dogs to join the household this generation, but I’d like to do so in the future, perhaps if one of my spares rolls the dog lover trait. 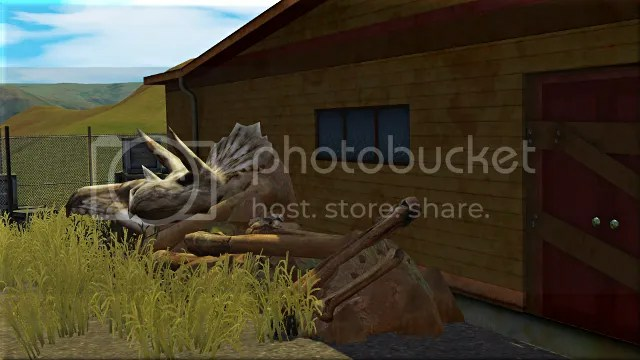 Appaloosa Plains is really beautiful, and the dinosaur theme – carried through to the ant farm, hunting collectibles, a couple of the premade sims as well – is a fun, unique hook. 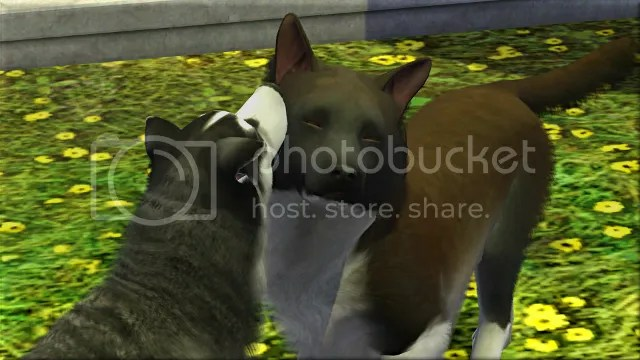 Nevertheless, this would probably be one of the packs I’d give up if I were forced to get rid of a few, because I don’t feel that pets are essential to my personal enjoyment of the game. 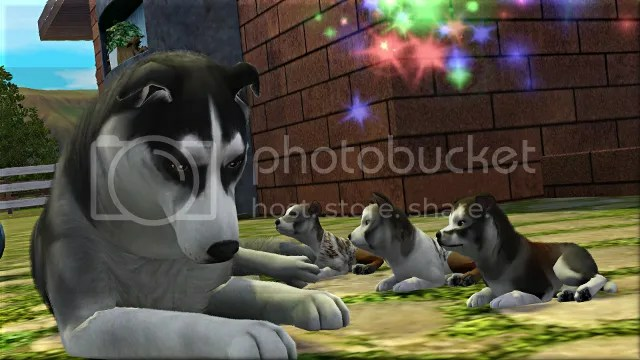 I adore the animals when I’m playing with them, but when I’m not I don’t really feel like something huge is missing in the way I would if my sims couldn’t go to university or on holiday or the weather never changed. I also have some other reservations. Obviously I think the genetics system is silly and frustrating, but there are fairly irksome routing problems with some of the pets as well, especially with horses and to a lesser extent with dogs. To interact with anyone, horse or human, Gaucho would always walk round in a circle first; even in queues of the same action repeated over and over, he’d do it between each one. Finally, I worry about the stability of the pack and its features, as I remember that a lot of people starting having major technical problems with their game around the time it was released. I decided against having Jaylen and Gaucho compete in the equestrian competitions because of the headaches I’ve had in the past (and also because it’s a rabbit hole so there wouldn’t be much to show you guys anyway); but I still had some pretty bad crashing issues at one point during this generation, which I had to roll back to an earlier save to escape. That said, the world otherwise ran very smoothly, with no error code 12s and basically zero lag. I’m so glad you enjoyed it! Yep, Boo is a real cutie, even though he doesn’t look much like his parents. Sending Gaucho away was a really tough choice. 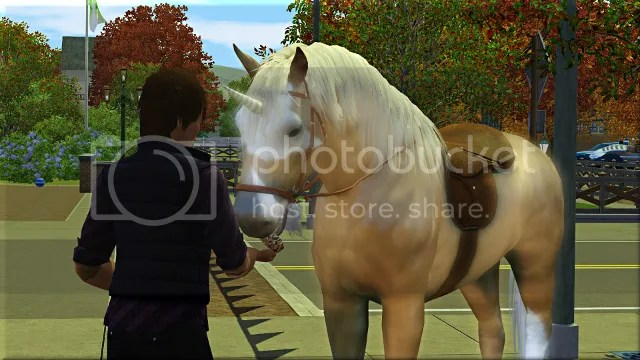 But I did feel a little better about it when I remembered that he was originally a wild unicorn who decided to join our household, so he wasn’t really dependent on my sims – he was just choosing to stay with them for a while. 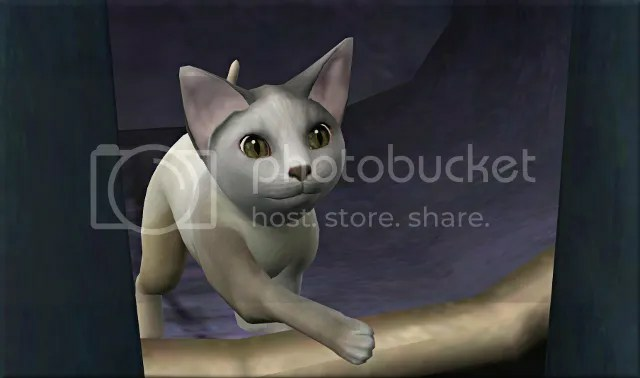 The pet genetics could definitely have been done better, plenty of examples of it here, but they’re all still very cute! Boo has such a cute little face, and Tamsie’s puppies, while their markings are ‘interesting’, have such cute faces too, and their ears are adorable! Awww and I love the Snuggle With interaction too, when my pets have babies it’s pretty much all I do, just queue up the interaction and watch and squeal!! 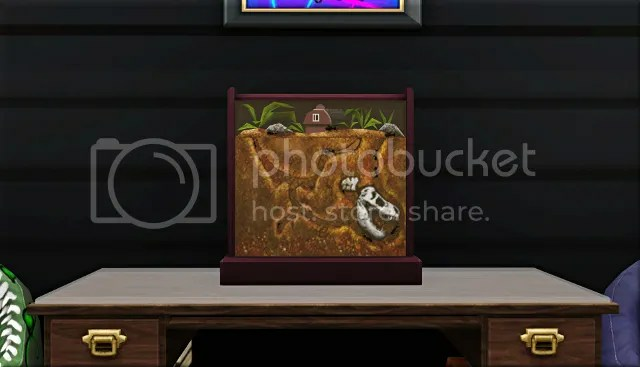 I’ll need to get an ant farm when my sims have kids, it looks really cool and is something I also completely overlooked. The dig site is pretty cool too, as you said, shame it’s not an actual lot, but they really did make an awesome looking area for the world. It’s nice that you’ve got an heir from each couple for the next generation, and I’m looking forward to seeing Starlight Shores and a play-through of the careers in your hands. I don’t have the Showtime expansion myself, so everything I’ve seen so far is from the Sims Wiki or Let’s Play videos. 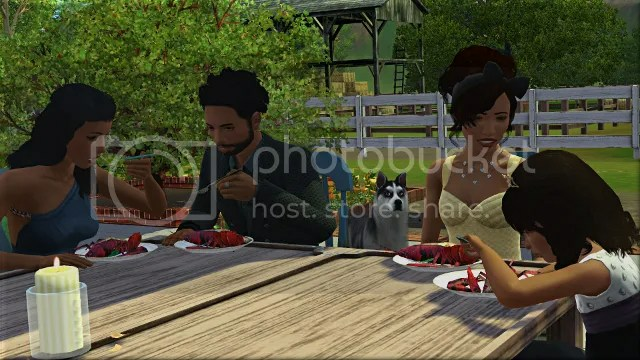 I guess it’s going to be quite a change in ‘feel’, much like moving from Bridgeport to Appaloosa Plains was – you’ll be going from a rustic, outdoorsy-type world to something altogether more glamorous. As always, I’m excited to see what to do with it! The faces are definitely cute, and the way they run around pushes all my ‘awwwwwwww’ buttons. They’re a lot more excited than they are coordinated, so they fall over a lot, which is also completely adorable. 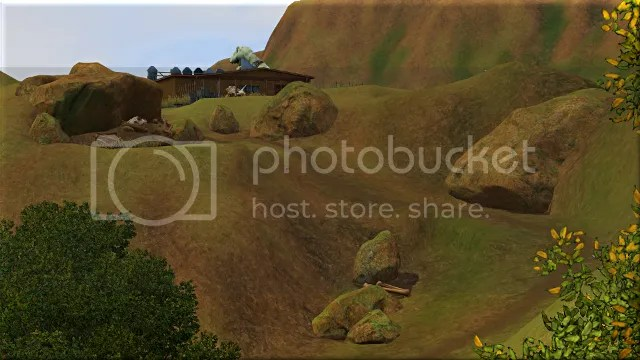 Yeah, the ant farm is a really nice find. I thought it was just a very simply animated decor object until a couple of weeks later when I saw what they’d uncovered! I read there are two versions of it, but I don’t know what the other one is. I’m glad I got the dino-themed one! I think SS will be quite different, but thanks to its various outdoor performance spaces and sandy beaches the country girls and boys of the earlier generation should be happy enough to make a home there. Thanks for all your support; I’m looking forward to sharing ST gameplay with you! 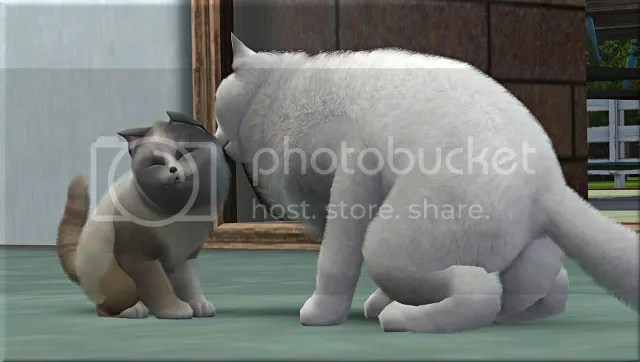 Great play-through of the Pets EP. 🙂 It’s amazing how much you manage to explore and showcase in a single generation. Not just the expansion content, but exploring the new world as well. Aasifa grew up nicely, his facial markings are more striking than odd, in my opinion. And for all their patchiness, the kittens and puppies are adorable. 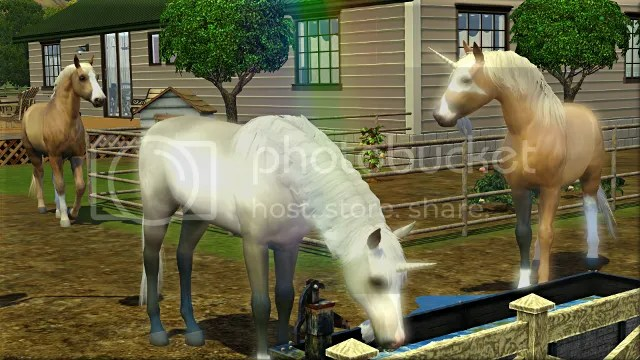 It’s a shame your game has such issues with the equestrian center. The horse(wo)man career is one of my favorites. I look forward to the next chapter and seeing what you do with Showtime. It’s one I haven’t explored much. I like what I have played of it, but for some reason just don’t think to do those careers often. Thank you 🙂 After losing some progress this generation (mostly building, but I also had to replay all of Janessa’s infant and toddler days) because of some kind of corruption, I really didn’t want to risk the contests, given the problems I’ve had with them in past. I’m looking forward to the next chapter too! I’ve just finished drawing out the rough plans for the house. I quite enjoy the ST careers, but, like you, don’t choose them all that often.